Whilst it shares similar standards as other Phuket villas within The Samsara Estate complex, Fah Sai brings a completely different style. Accommodating up to 10 adults in its 5 luxurious bedrooms, whilst it also perches on a sloping rocky hill, Fah Say provides all of its luxurious facilities in two floors and therefore more affordable to live in. It is fair to say that Fah Sai is the jewel of the crown, the best villa among luxurious villas The Samsara Estate has within its exclusive complex. Stretching as you enter the main entrance is spacious living area with expansive view of Nakalay Bay and Patong Beach over a soothing onyx tiled reflective pool. To the left-hand side is the villa’s master bedroom that comes with private lounge and adjacent owner’s study room, all shares similar views as the living area. To the right-hand side the formal dining table in a raised platform along with professional-grade kitchen. Outside the kitchen, hanging off the cliff, is an wooden-decked terrace that serves as outdoor dining space with BBQ equipment. A stairway leads down to the lower level where a huge 18-meters long private swimming pool is located. The most notable feat on this level is the junior master suite. Built as the front-most part of the house, this spacious bedroom gives breathtaking views through its glass paneled walls. Along the other side with wide verandah are three guest suites and entertainment room, all enjoy beautiful ocean view over the infinity-edged swimming pool. One of the guest bedrooms can be converted into a dedicated spa room if it is not needed for accommodation. The entertainment room has plush sofa, state-of-the-art audi0-video entertainment equipment with large LCD-TV, game console, and some exercise equipments including motorized digital treadmill. All of the bedrooms at Villa Fah Sai has large double bed with high quality mattress. Air-conditioning and private en-suite are standard to all bedrooms. The master suites have canopied four-posters bed. 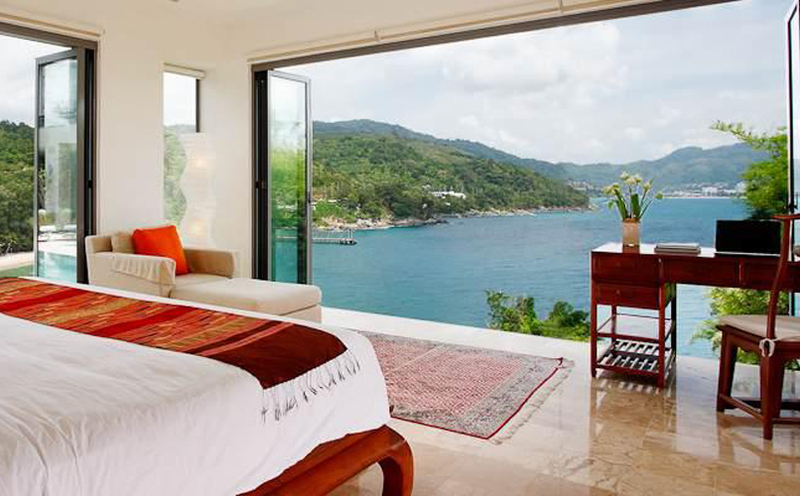 Whilst the master suites enjoy the best view, all bedrooms have beautiful view over Nakalay Bay, Patong Beach, and Andaman Sea. All bedrooms have private en-suite, all of which come with standing shower except the junior master suite that has jacuzzi-tub in addition to standing shower. The name, Fah Sai, can be freely translated into “house of the full moon”, and it brings what the name promises, gorgeous full moon over the glittering Andaman Sea, if you come to stay at the right time. But even otherwise you will still enjoy one of the most breathtaking views you may have ever seen the whole lifetime.